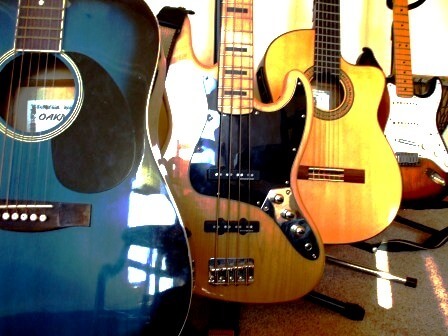 Ideally in my opinion, a guitar that has been played will sound better, it is true for vintage electric guitars (that’s why there are so expensive) but also with few years old acoustic…so second hand guitars, as long as they are in good condition, are great guitars to buy (it’s like good wine in a way!). What does that mean? If you’ve spotted a guitar and you’re happy with the sound and look? Then what you should do is spend at least 10mn playing all aspects and bits of guitar playing that you know. Your play has to run smooth and you should be cruising. If you’re a beginner it’s not that bad if the neck is not comfortable. You have to learn the hard way in order to be comfortable later 😉 If you’re not a beginner anymore then go for a neck that will suits your playing the best. In other words, you have to find a good match between: look, sound and playability. These aspects are not so important, some people will be more Fender than Gibson in terms of sound, and there is different budgets and different tastes, so no relevant advice here. One thing to know though: a guitar is not great just because it’s expensive ! Forget that idea. In the early days of rock n roll, even when I started in the late 80’s, it was better to choose a good brand and save a certain amount of money to get it. Nowadays, guitar is such a popular instrument that you can find good brands, good copies that are almost as good that the real expensive ones! For me going to all you local shops and shop around is the best as you can try out you future guitar, bargain the price down, etc… Buying off the internet is not a bad thing if you’re sure about the model and if you want to save a bit more more money, it can suits you even if you haven’t tried it. Personally I’ve come to a stage now where, I need to touch and feel the instrument to be happy…the more you become advanced, the more you will be demanding on what you the guitar you want. That’s it folks! Good luck in finding the one! PS: Feel free to contact me if you need more particular info on this topic, I’ll be happy to help!